Day 1: St Malo – Iffendic. So, we’re still alive and going after 4 days on the road. Lack of internet access and general WordPress phone app inexperience and irritation have prevented update before now. Don’t move to rural Brittany if FB is important to you whilst on the move. We sailed overnight from Portsmouth to St Malo ‘sleeping’ in the floor. The thing that I always forget is how sociable cycling is when on the road. You can talk to other cyclists about your respective journeys. When this happens; we always win as no one is ever doing a trip as stupid as ours. As cyclists are naturally competitive, this is pleasing. General passers-by say hello and ‘Bon courage’. So we look like we need it? Cycling itself is the perfect shared activity: you are with another person, but mostly you’re not speaking to each other (you get to take turns looking at each other’s bottoms). This is our stuff. It looks a lot but is pretty pared down and includes tent and camping gear. Clothing is bare minimum. My bike is a Specialised tri – cross and Keith’s is a 20 year old Orange mountain bike. Mine is much lighter and easier to ride on a trip like this but his is better geared for hills. He will be fine when we get to Spain. I will be walking. Lessons learned from my solo Le Have to Barcelona bike trip of 2013 include: take a decent bike. A bike sold on ebay for a starting price of 99p is not up to the job (it lasted 2 days). 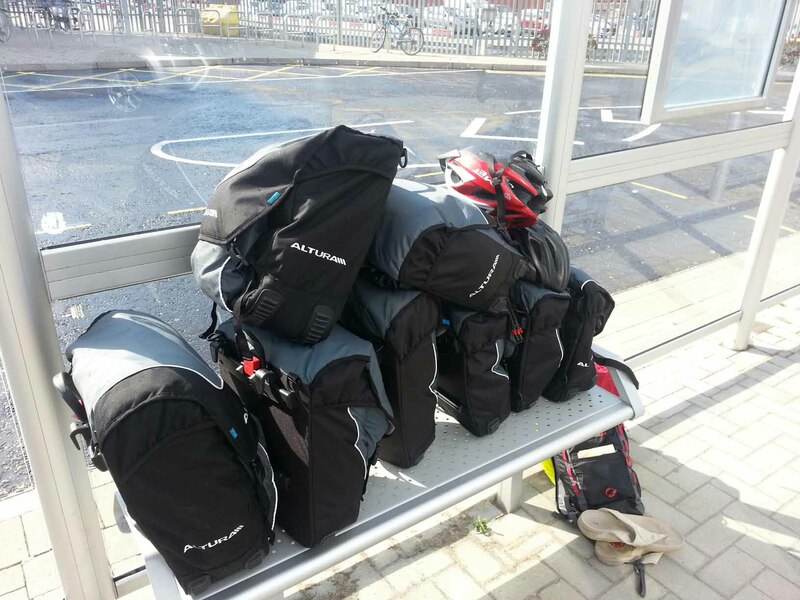 Spread the load: last year I put all the weight into rear panniers and 11 spokes broke on the rear wheel – all at once. 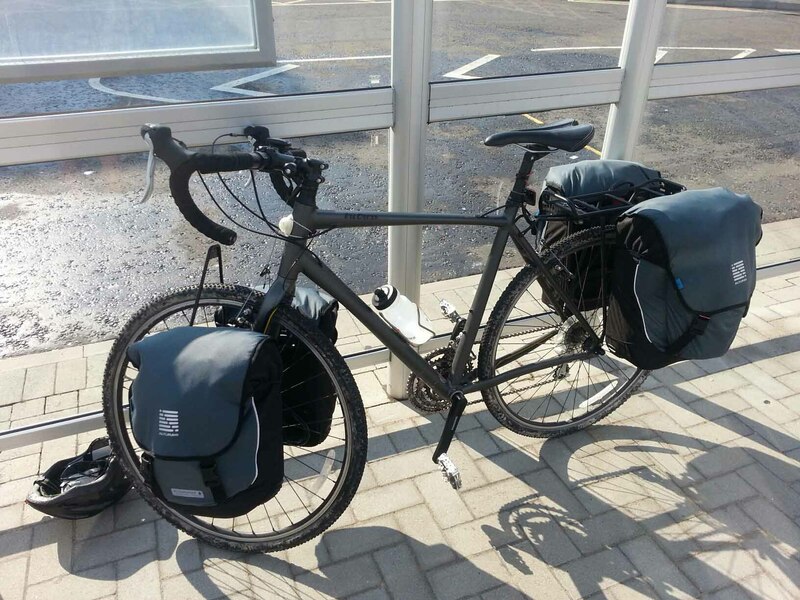 This year we have front and rear panniers each. 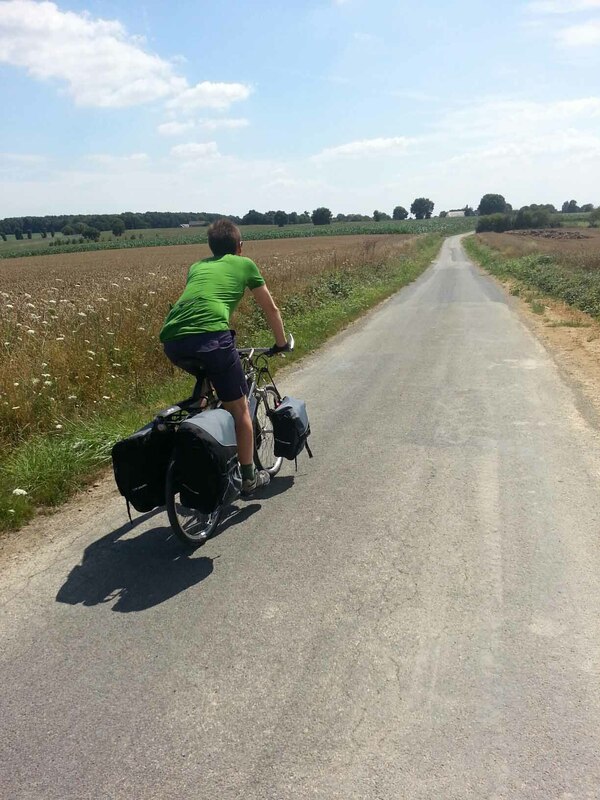 Day 1: St Malo to Iffendic. 85 km. 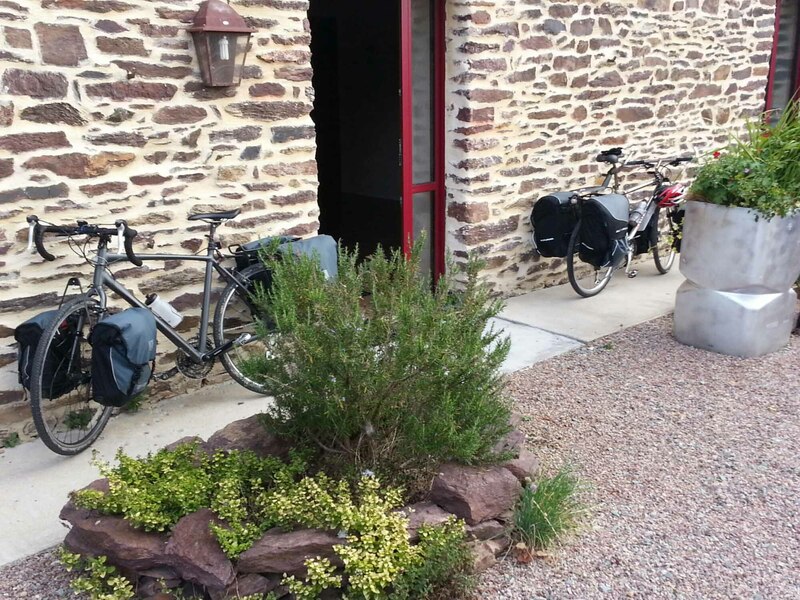 Brittany is great for cycling. Empty roads, not too many hills and crepes. 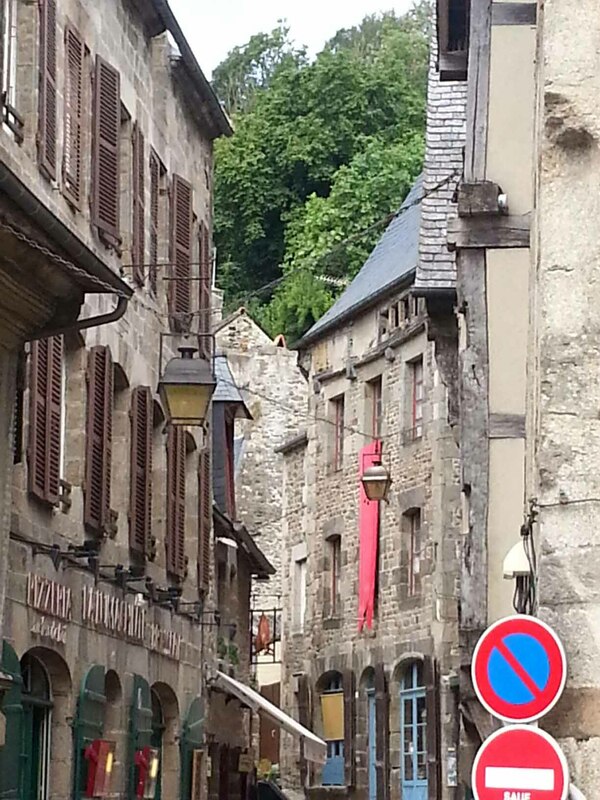 We stopped in Dinan. After one and a half hours,we realised we had been there before. Goldfish memory has its uses; enjoy the same experience time and time again. Renders travel unnecessary. 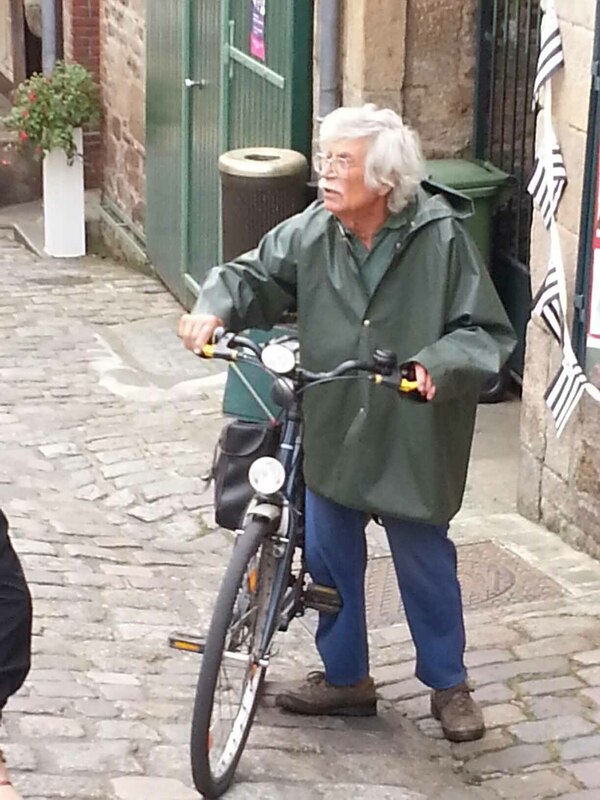 The fella with the bike was on a very steep, cobbled street. I would like to have seen him ride it. We continued on through Brittany which is hillier than you might think. 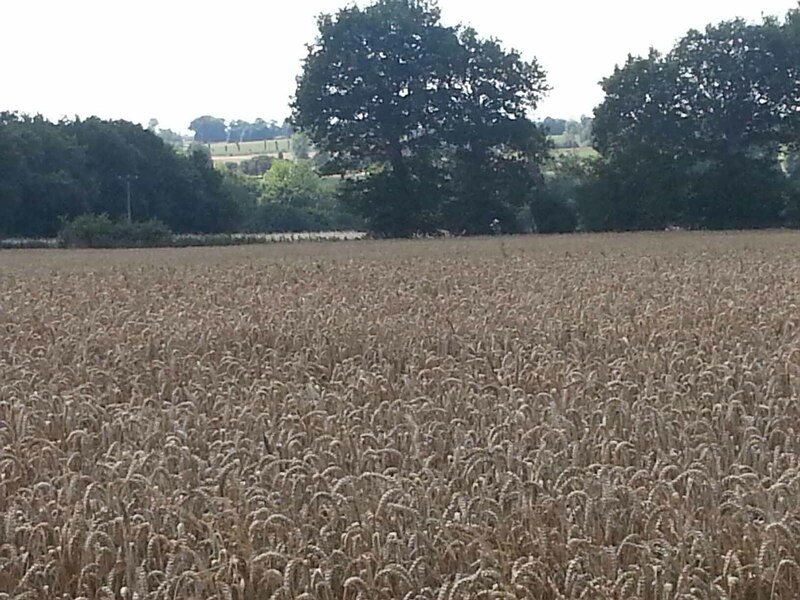 Blue skies, fields of wheat and corn and a lovely flat bit on a cycle route down an old railway line. We stayed in a pre-booked Chambres d’hote, L’Etang de L’Aune, near Iffendic as we knew we’d be knackered from boat sleeping. It had a pool. Nuff said. All the chambres d’hotes I’ve ever stayed in have been brilliant. Lovely people who make fabulous hosts. The food is often amazing and this one was no exception. The owner was a chef in the US for 20 years. We had 4 courses, including duck with blackcurrant sauce and homemade chocolate cake and coffee for € 26. 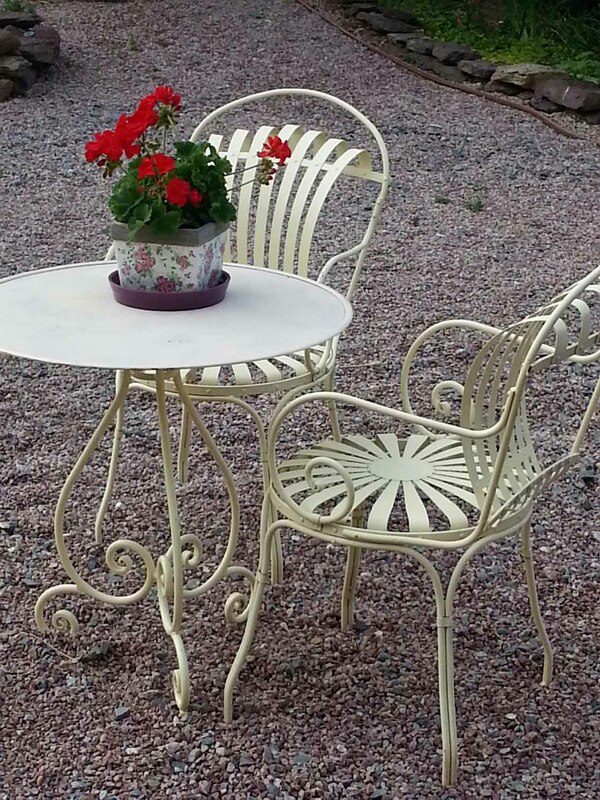 An extravagant first night booked before redundancy but worth it. Dinner is always served at a shared table, so we ate with a couple from Cardiff travelling on a tandem. He was a bigger bike nut than Keith so cycling as shared interest and socially acceptable special interest facilitating small talk for the socially bollocksed (copyright Hendrickx) applies here. Half a bottle of wine assisted. We congratulated ourselves on our performance. We managed to present an adequate facade of normality and (as far as we know – and we did debrief afterwards) did not offend, say anything weird or kill the conversation. Oh, apart from Keith refusing to eat a yellow tomato because it was the wrong colour, but that’s minor. This is a rarer occasion than our presentation suggests so we were justifiably chuffed. 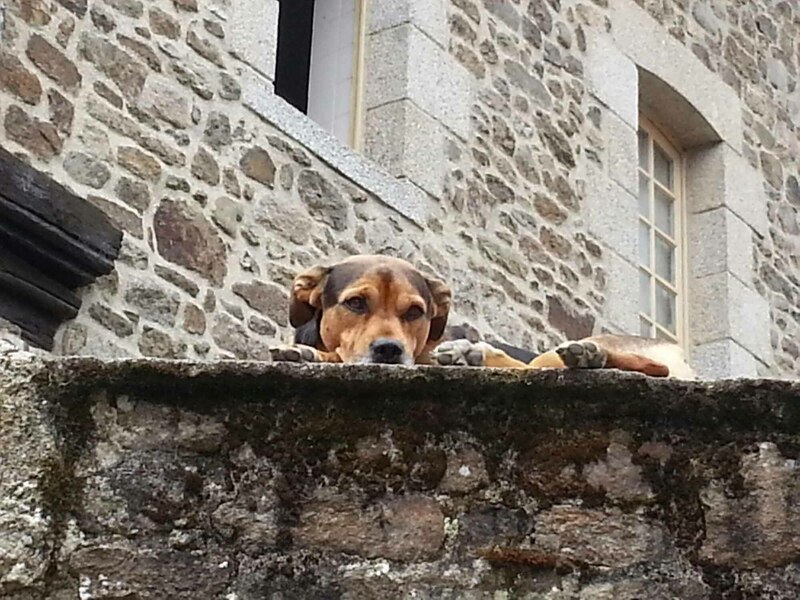 This entry was posted in Cycle Trip 2014: St Malo, France - Santander, Spain, Cycling, France, Travel and tagged cycling, Dinan, France. Bookmark the permalink.